The News & Notes email newsletter shares the latest news, announcements and stories from The Arnold P. Gold Foundation approximately once a month. Each issue includes a variety of updates on our programs and events, announcements of program deadlines, profiles of work we have supported and those who have been honored as exemplars of humanism, insights into building a culture of compassion, and much more. To subscribe, click here and select News & Notes. 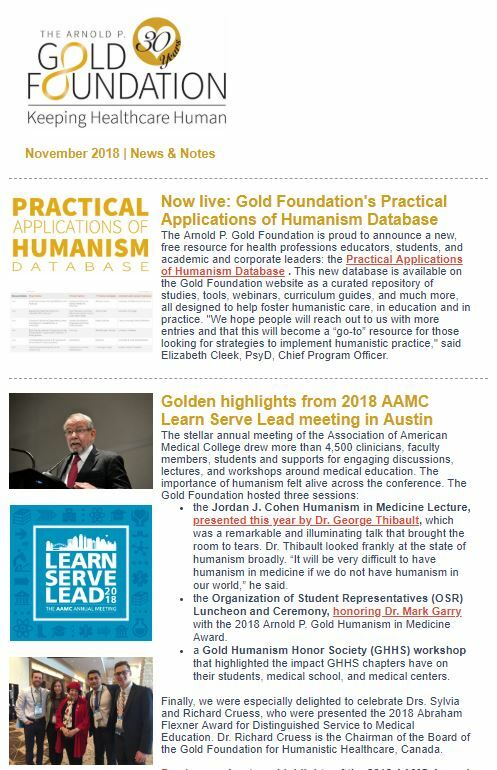 Example of the beginning of the News & Notes newsletter, November 2018 edition. Note: News & Notes in December 2018 was replaced by a special edition: 10 Touchstones of Humanism in 2018.